The twin high-rises, named after their luxurious addresses, are legends in the lineage of Chicago high-rises and of modern architecture itself. 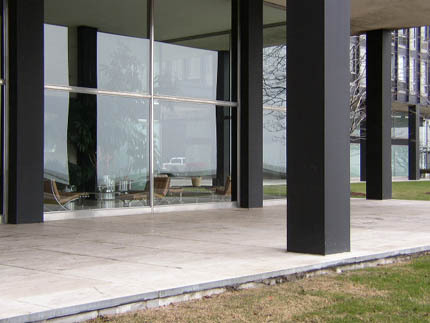 They are among the first tall embodiments of Mies' lifelong meditation on structural clarity. The reticent architect was precise and refined in this work, eloquent from the careful placement of the slabs on the trapezoidal site to the subtly cadenced A-B-B-A rhythm of windows along the perimeter. The most radical feature of the building, though now trite to contemporary eyes because of the countless knock-offs, is the skin-and-bone expression of the steel and glass towers. The steel I-beams effortlessly define the structure while the glass suspends and encloses space. It was, in a way, two buildings that so simply assert their essence that they dematerialize and become 'almost nothing'. "... first I am going to tell you the real reason for those mullions, and them I am going to tell you a good reason by itself. It was very important to preserve and extend the rhythm which the mullions set up on the rest of the building. We looked at it on the model without the steel section [I-beams] attached to the corner columns and it did not look right. That is the real reason. Now the other reason is that the steel section was needed to stiffen the plate which covers the corner column so this plate would not ripple, and also we needed it for strength when the sections were hoisted into place. Now, of course, that's a very good reason-but the other one is the real reason." It was important for Mies to express the structure of the buildings and the applied elements did not fall outside of his exacting logic, but were rather essential to the poetry of the towers. 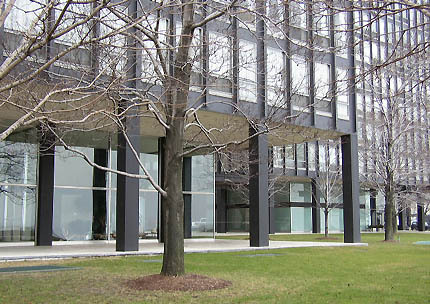 Though private residences, the City Council deemed 860-880 Lake Shore Drive Chicago landmarks in 1996. 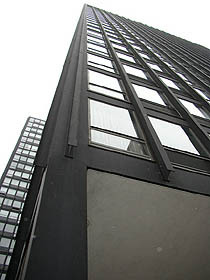 The building is located within walking distance from the Loop, along Chicago's gold coast. Most people can only view the buildings from Lake Michigan's shores or from the public streets surrounding the building. One can also do a quick drive-by viewing by cruising down Lake Shore Drive. Only the privileged few can enter the private property, though design magazines often feature interior shots of select units. By Subway: Get out on the Chicago Station of the subway in downtown Chicago at Chicago Avenue and State St. Walk East on E. Chicago Avenue for 5 blocks until Mies van der Rohe St., make a right on East Chestnut St and walk towards the lake. The towers will be on your left on Lake Shore Drive. Chicago Landmarks features 860-880 Lake Shore Drive at www.ci.chi.il.us/Landmarks/numbers/860880LSD.html. 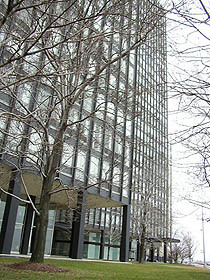 A fan site dedicated to 860-880 Lake Shore Drive Apartments is at http://members.aol.com/richpat/860/860d2npm.htm.